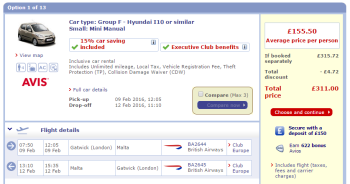 BA Gatwick £150 Club Europe sale – add a hotel or car for £2 to £6 per night! I wrote yesterday about the amazing £150 Club Europe sale that British Airways is running for just 48 hours. It ends at midnight tonight, Wednesday. You can find full details on ba.com here. There are some incredible deals, such as Malta or Marrakech for £150 return and 160 tier points! I wrote the article yesterday at 6am and so didn’t have much time to play around with the actual fares themselves. What I didn’t spot at the time is that these prices are also valid in conjunction with BA Holidays. Yes, that is three nights in a four-star hotel in Malta plus business class flights on British Airways for just £169 per person, based on two sharing. The hotel costs you £6 per night per person on top of the £150 cost of the flight! Or, assuming you would use points for a hotel, why not throw in a car? Yes, you read that correctly. In this example, you only pay an extra £5.50 (£1.80 per day!) 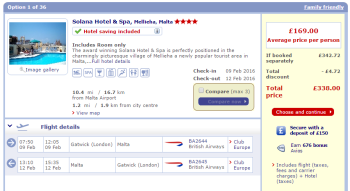 to add a car to your £150 Club Europe flight to Malta. Similar deals are available to other destinations in the sale. Take a look at this page on ba.com for the £150 sale rules and travel dates and then see what you can find. Remember that you need to book by midnight tonight, Wednesday. Another country off the list… Vienna booked for February.